Prepare clear gelatin. Flavor with lemon juice, touch of sugar. Add drop of blue vegetable color. Pour thin layer in loaf pan or bowl. Chill until slightly thickened. Prop escarole sprigs, parsley, and scallion to pan edge, suspended upside down. Next, the fish! Press bright pimiento "fish" cut-outs into first layer. 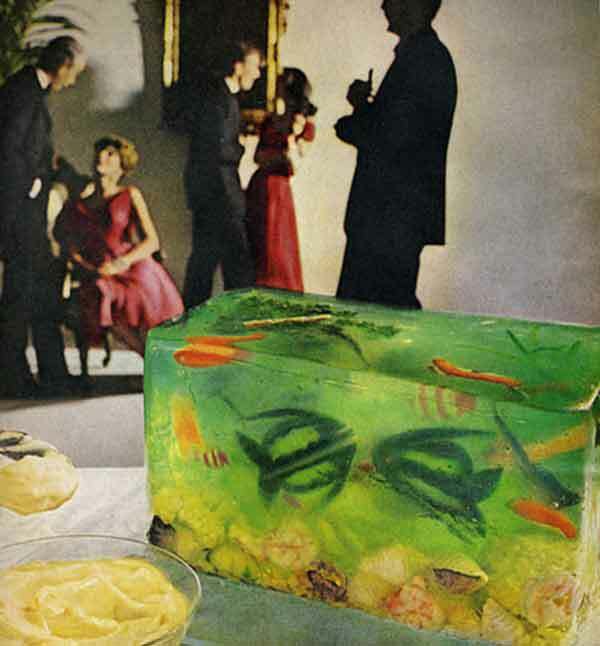 Continue making gelatin layers with vegetable "fish" (cucumber, carrot), at different levels. Mold last layer with shrimp, shell macaroni and cauliflowerettes for "ocean bed." Slice, and garnish with ripples of Hellmann's Real Mayonnaise, famous for the lightness of whole eggs... whipped high and smooth.